NEBRASKA: Seven Hours Of Pro & Con Testimony Over Lincoln's LGBT Bill - Joe.My.God. 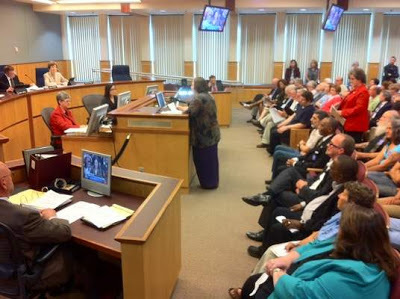 The city council of Lincoln, Nebraska endured seven hours of testimony yesterday as they considered a new ordinance that would protect LGBT residents from discrimination in housing, employment, and public accommodations. The usual asshats were on hand. Opponents said the ordinance would impinge upon their religious freedoms by requiring them to accept behavior they consider immoral. “Our faith is something that’s been the moral code for four thousand years,” said the Rev. Chris Kubat, director of Catholic Social Services. “Now” — he snapped his fingers — “you’re going to force us to do something that’s against our faith. Last year we assisted more than 28,000 people. Most weren’t Catholics. If people are hungry or naked or thirsty, I’m going to help them. I don’t care who they are or if they’re gay, but don’t force me to cooperate with behaviors against our faith.” Kubat said the church’s opposition to the proposal would be “mitigated” by an amendment that creates an exemption for religious organizations, but he said the church would prefer to see a conscience clause exempting individuals based upon their sincerely held religious beliefs. I believe an ordinance like this is a small step, a very small step, but it’s a step towards making Lincoln an infertile ground for the attitudes that nurture the mindset of these two (1993 murderers of Dillards gay shoe salesman Harold Grover) and for all those other people whose own moral conscience is so weak and debased that they judge people by their characteristics rather than their character.